Tom Watson lives in Chicago with his wife, daughter, and son. He also has a dog, as you could probably guess. The dog is a Labrador-Newfoundland mix. Tom says he looks like a Labrador with a bad perm. He wanted to name the dog "Put Your Shirt On" (please don't ask why), but he was outvoted by his family. The dog's name is Shadow. Early in his career Tom worked in politics, including a stint as the chief speechwriter for the governor of Ohio. 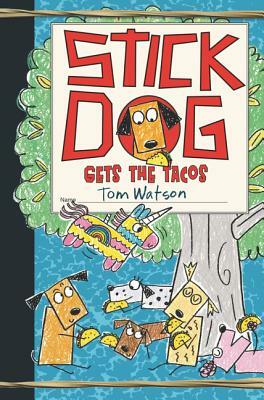 This experience helped him develop the unique, storytelling narrative style of the Stick Dog books. More important, Tom's time in politics made him realize a very important thing: Kids are way smarter than adults. And it's a lot more fun and rewarding to write stories for them than to write speeches for grown-ups.